I'd like to be able to hold down a modifer key when dragging folders into a DOpus Collection, and let the modifier key determine whether I add them as "Members" or "Sub-Collections". EDIT: Ignore this post, it doesn't work for collections. Add COPYTOCOLL=member or COPYTOCOLL=sub to the Copy command to make it always do one or the other without asking. Note that while COPYTOCOLL can be used (and will be ignored) for copying to normal folders, and is fine to use in your general copy action from that perspective, it will prevent the copy from being ever being queued. If you use the copy queue via drag & drop, you would not want to use COPYTOCOLL on the main Drag-and-drop event without qualifiers. 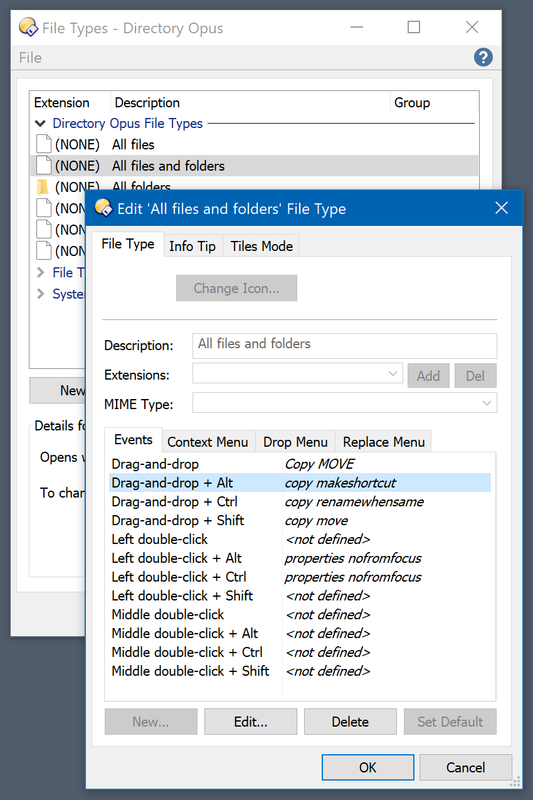 If you want to change the default behavior (when no qualifiers are held down), you can do that under Settings > Preferences / File Operations / Copy Options. That's better than changing no-qualifier Drag-and-drop event, since it won't prevent copy operations being queued. Of course, this also affects copies done via methods other than drag & drop. Collections seem to be different. They don't allow drag-and-drop with modifiers and the plain one looks to have Copy hardwired into it. So modifying the File Type event will not change its behavior for collections (at least in my testing). Oops, you're quite right. I'm not sure if there is a way to change the left-mouse drag & drop events for collections in that case, other than the default action (members, sub-collections or "ask") via Preferences.